The Norvan features Gore-Tex Active with Shakedry, one of technical apparel’s latest and greatest waterproof membranes. This fabric consists of only two layers: an outer membrane layer with a water-shedding surface, and an inner liner that provides comfort against bare skin. This simple but effective construction is what allows Arc’teryx to make the Norvan so lightweight and packable. Despite an impermeable face fabric, our testers found that the WaterTight zipper was in fact not water-tight. Several heavy precipitation runs left a tester feeling damp under the front zipper, but the leak was confirmed after a 5-minute shower test let substantial water through. The Norvan’s performance in the shower test placed it fourth in terms of weather-shedding ability in this testing lineup. 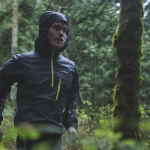 The Norvan SL Hoody boasts remarkable breathability due to its Gore-Tex Active shell fabric. The ability to shed some face fabric from the jacket also improves the jacket’s breathability over time and use, because the wetting-out of face fabric blocks moisture from escaping. Our testers reported feeling comfortable even on moderate runs on humid days. The breathability of the Norvan tied for first with the Gore One Jacket in this testing lineup. Consider the verified weight of the Norvan at 4.4 ounces (125 grams), and it might not come as a surprise that it lacks the features of many outer shell layers. 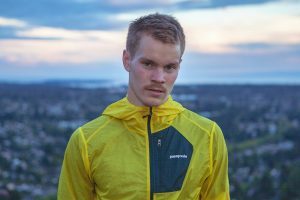 The moving parts of this shell from Arc’teryx include only the front zipper and a lightweight elastic toggle to tighten the hood. That toggle pulls the back of the hood downward approximately one inch. Testers reported that the small hood adjustment was enough to cinch it down, but insufficient to keep it in place while battling fierce winds. A unique button system is located just above the hood toggle and inside the collar of the jacket. This feature allows the user to roll the hood down and button it in place. Loose elastic fabric covers the bottom half of the cuffs and waist of the jacket. A comfortable fabric lines the hood and includes an inner nylon bead to shape the brim. The Norvan SL Hoody does not feature any pockets, so run snacks and personal items will need a different home. “Plan on keeping one hand free for your house keys, or put them in your shorts,” suggested one tester. The fit of the Norvan Hoody is best suited to mesomorphic and ectomorphic body types due to a rather narrow torso. The sleeves are sufficiently long to cover the wearer’s wrists while arms are outstretched for activities like cycling.. The Norvan has a long torso and is sloped downward in the rear to protect from rain or mud kicked up on the trail. One benefit of the Norvan’s streamlined design is its comfortable fit under the shoulder straps of a pack or running vest. No chest pocket means the fabric lies flat against the base layer of the user. The front zipper features a chin guard to protect skin from pinching. The Norvan SL Hoody comes with a tiny stuff sack – about the size of a softball. The shell is easily stuffed into the paper-thin sack for rain protection that travels well. However, because the jacket features no pockets, the stuff sack will need to be carried along once the jacket is deployed. Our testers found that the stuff sack could be easily misplaced, thus the Norvan tied for 2nd with the Minimus 777.